The Seaboard range of instruments isn’t so far ‘out there’ that it requires a complete brain rewiring and a total rethink about how you make and perform music. However, it does effectively throw the concept of the keyboard – or controller – into the air and rearrange the pieces into a completely new form. The opening salvo was the Seaboard Grand, an expensive first stab at the new controller concept and one which set a blueprint for the style of the series, with its distinctive black, rubber-like keyboard and a futuristic look and appeal, not to mention an added dimension or three (literally) of ways to control your music. 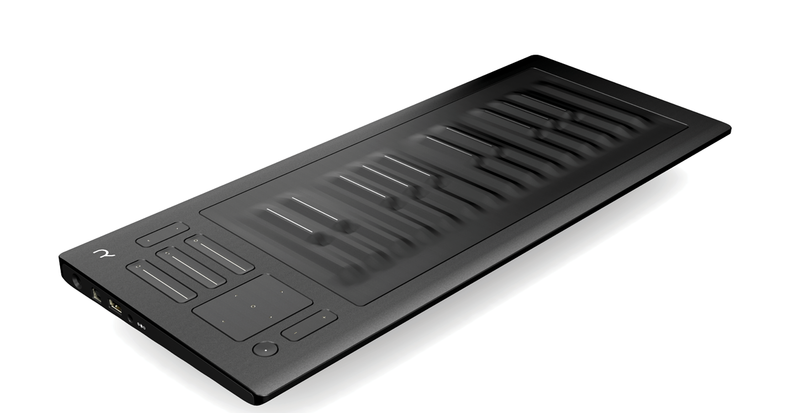 Enter the RISE, a compact version of the Seaboard that’s aimed at everyone, and at a far more attractive price of £599. What these new types of keyboards offer you over your standard ‘black and white’ efforts is, essentially, whatever the hell you want. The extra dimensions offered can be assigned to pretty much anything, as with any good controller, but that’s down to the performer to convey.However, new technology requires a certain amount of ‘spoon feeding’ so the genius of RISE is that it comes with a piece of software, namely a synth called Equator. TRISE comes in a “beautiful protective case” which looks like it was sculpted from some futuristic substance. A closer inspection reveals it to be a lightweight plastic material. I’m pretty sure it will protect, but I’m not sure for how long. And I could have done with a handle – yes, I’m being picky. However, what lies within the case is quite stunning. There are none of the flashing lights you find on just about every other music-making device these days. This is sleek, dark and ominous. When slotted into my studio set-up, it was rather like Knight Rider turning up at a vintage car rally. When you first get up close and personal to a Seaboard, like me, you’ll touch it – quite a lot. It’s smooth, compact and heavy – a little too weighty, if I’m honest – but it feels sturdy enough for stage and studio use. The main Keywave Surface is silicone and the keys have a squidgy feel – you’ll very likely pinch them for a bit during your first ten minutes. There are a good half-dozen controllers on the left of the main keyboard and, yes, we can call it that (for the moment at least) because you can play it as such and there are 25 keys laid out over the trad 2+ octaves. The connections are minimal and around the side. You don’t get any audio outs as this is a hardware controller which works with the bundled (as a download) software of the Equator synth and Dashboard software. Consequently, you just get a couple of USBs (handling MIDI, power and charging), DC power plus a pedal in. It’s minimal but so is the whole design ethic. Also worth noting here is that the unit will operate wirelessly via Bluetooth (press the preset button ‘Up and Down’ simultaneously) with an internal battery lasting a promised 12 hours, and that RISE charges via USB and has an indicator that flashes every few seconds. 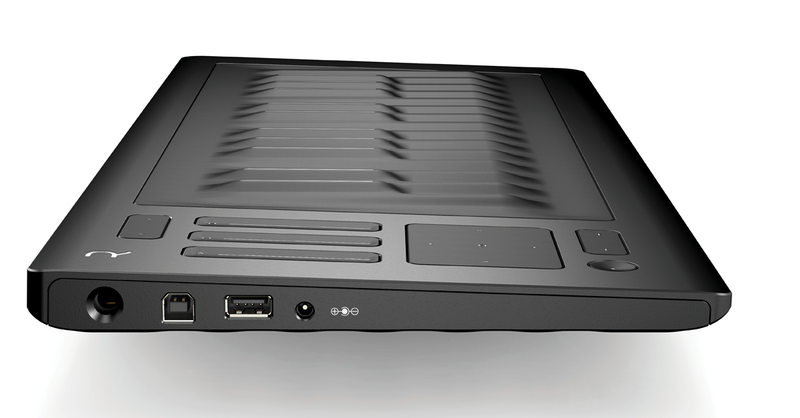 Let’s introduce the concepts that cover the ROLI and RISE user philosophy. Firstly, the Dashboard software is a standalone app that enables you to tinker with the hardware. 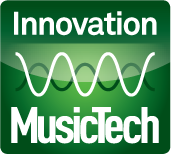 Then there’s the MPE (Multi-Dimensional Polyphonic Expression), the protocol that RISE uses which enables MIDI to manipulate its extra controller dimensions. 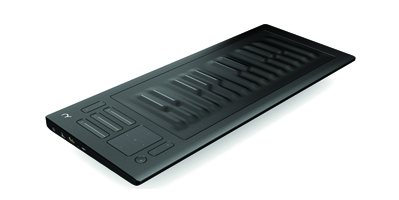 ROLI describes these as ‘The 5 Dimensions of Touch’ and these are crucial to the Seaboard philosophy. They are Strike, the force of your finger hitting a key; Press, the continuous pressure applied after a Strike; Glide, horizontal movements on a keywave; Slide, vertical movements; and finally Lift, the speed of lift-off after a Press. It isn’t that hard to get your head around – you’re looking at horizontal swiping and added control over key pressing. Once you grasp this handful of ‘dimensions’, you’ll understand one of the two main modes a little better. 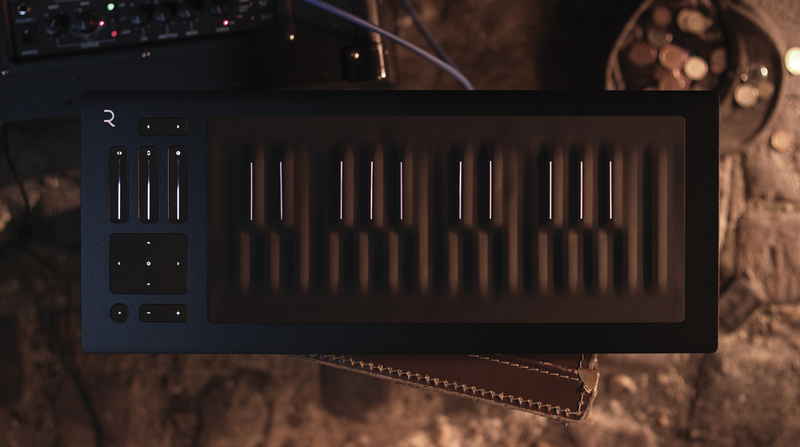 Expression Mode is a way of playing the Seaboard RISE, controlling Glide, Slide and Press using the three Touch Faders to the left of the main keyboard. Expression Curves are essentially graphical curves which represent the five dimensions of touch. Visualiser, meanwhile, is a way of using the Dashboard software to simply look at how the dimensions are acting on the Keywave Surface. You also get the more standard MIDI Mode, which enables you to assign the three Touch Faders and the X-Y Touchpad that’s also on the left of the keyboard to any MIDI CC. In Expression Mode and MIDI Mode, when the power button displays as white, the X-Y Touchpad is also assigned to various parameters ,which you just change by sliding. 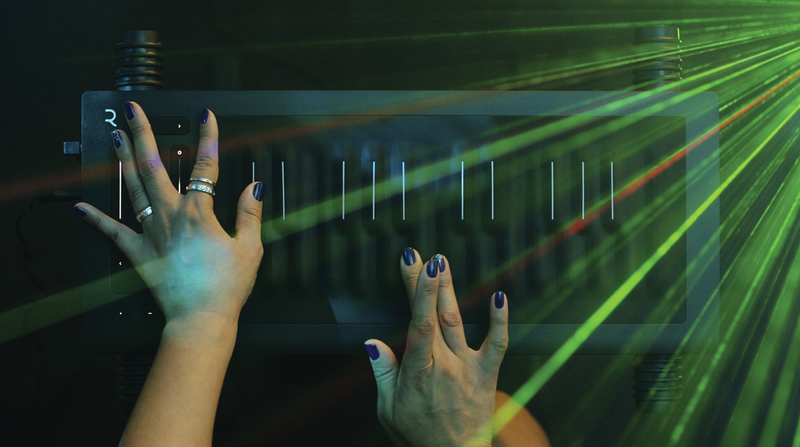 In MIDI Mode, the Touch Faders can be assigned to any MIDI CC – typically, vibrato for the Slide control. Although these are lots of fun, even more can be had simply by playing the keys in a variety of different ways. You can, of course, simply kit a key (or ‘Keywave’) and sustain the note – that is, play it like ‘normal’. There’s a chance that you might find the Keywaves a little less responsive than you’re used to if you use a light-weight traditional keyboard – so don’t expect a traditional playing experience here. And you’ll have to learn some fresh techniques as there are a lot of new ones on offer. If you hold a note with the end of your finger and then move it quickly from left to right you’ll introduce a vibrato and pitch bend effect – this is Glide Vibrato. Doing the same thing up and down along the note is called Slide Vibrato Glide Glissando makes use of two not-so-obvious pitch ribbons at the top and bottom of the Keywave Surface. Continuous Press Modulation is like aftertouch in that modulation will be increased or decreased according to the pressure you apply after a note is played. Similarly, Slide Modulation comes in when you quickly move your finger up and down. This isn’t to be confused with simply moving your finger up and down after you play a note within certain sounds in Equator, which results in a fade between elements of that sound. I found myself doing this more than any of the other touted playing styles as it’s the most dramatic effect. Exploring these techniques, on a performance level, you’re already leaps away from a normal keyboard. And of course these styles are only scratching the surface, as you don’t have to change the parameters stated within each. Because it’s MIDI-based and MPE standard, you can use the playing styles to change other parameters, making the whole experience massively creative. I found myself playing up and down the Keywave surface, using several of the more glitchy sounds in Equator, and because I was introducing the new, subtle (and not so) playing methods as I went along (sometimes accidentally, I have to admit) the sound was changing a lot. Eventually. the sound evolved far more dramatically than I could’ve ever hoped for when playing any other keyboard/synth combination ‘normally’. These new techniques obviously take some getting used to, but practising them will really help you to get more creative with the controller,for both recording and performance. The Seaboard Grand was, and still is, an intriguing product but perhaps one that’s only destined to be a keyboard used by rich pop stars or endorsees like the ubiquitous Jordan Rudess. 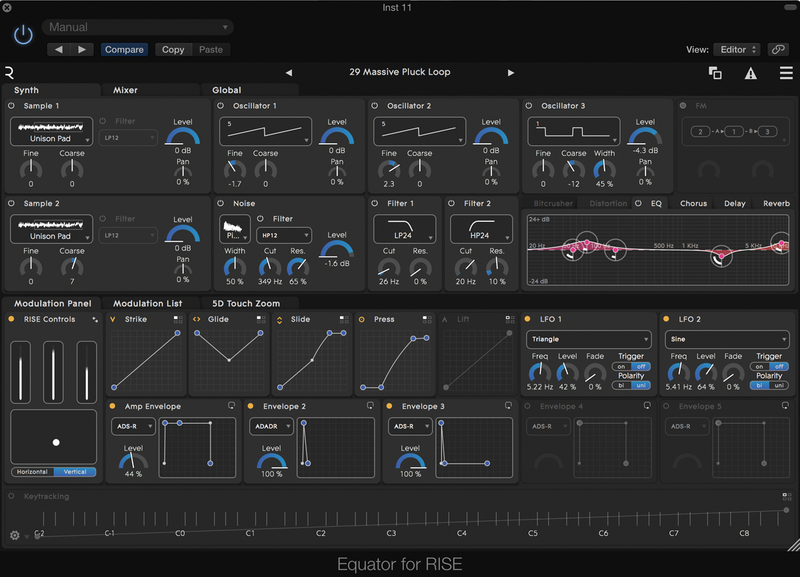 RISE, on the other hand, is priced brilliantly and the Equator software takes it up yet another notch, turning it into a serious contender and potentially taking ROLI out of the achingly trendy Shoreditch area of London into studios and onto stage across the world. It’s beautifully built, solid and even though it’s an untried technology you do feel that you can trust it. Longer term testing and software updates will come but we’re still at V1 on both counts so I’m hesitant to recommend RISE without reservations. But even as a seriously cool MIDI controller and soft synth, £599 isn’t too far off the money when compared to some of the alternatives (see box below). So if you were just to use RISE as a standard controller keyboard you’d be doing okay. Add in the extra potential offered by the five Touch Dimensions and how they interact with Equator and you suddenly have a serious piece of kit, one which easily provides more hands-on control over different parameters of your sound than your standard keyboard user. Remember, in MIDI Mode you’ll be able to apply some of those new playing techniques to other parameters so you can explore in 3D while others stay in their flat, ordinary dimensions. Of course, using MIDI, the potential level of creativity that RISE provides are in areas that people with standard controllers might already be able to explore. Indeed, that’s my one caveat for recommending RISE completely. ROLI probably wants it to. That said, it’s £599 for a new piece of smooth tech – and with Equator thrown in, that makes it a great buy. And for sticking its neck on the line to produce a brand new piece of hardware that’s totally unlike anything else out there? Well, ROLI can only be applauded. RISE is solid, sleek, great value and can sound superb. a:Presets/Bluetooth – Switch through presets, up and down. Press both simultaneously to enable wireless Bluetooth operation with other devices. b: Touch Faders – In Expression Mode these faders control the Glide, Slide and Press Touch Dimensions. In MIDI Mode they can be assigned to any CC. c: X-Y Touchpad – In Expression Mode this touchpad controls parameters in Equator. In MIDI Mode it can be assigned to any cc for external synths. e: Pitch Ribbons – These hidden pitch bend strips extend along the whole keyboard, top and bottom, and are used with the Glide Glissando playing technique. f: Keys/Keywaves – As you can see the keys are laid out in traditional octaves (the black keys now have white stripes) but this is as old school as the RISE gets.